Cheap flights to Switzerland: Prague-Geneva for €60! UPDATE 11.10.: cheap flights from Prague to Geneva and also Basel again available for just €60/1648 CZK! Travel dates from December: e.g. 5.-7.12., 11.-14.12., 13.-16.1., 5.-10.2. Book here. UPDATE 8.9.: new dates for flights from Prague to Geneva including weekend breaks: 7.-9.11., 13.-16.11., 21.-23.11., 4.-7.12..
Swiss still offers cheap flights between Czech Republic and Switzerland as we already informed you couple of times. Return flights from Prague to Geneva are available only for €60 / 1644 CZK! This price is valid if you travel with cabin luggage up to 8 kg. Travel dates are from July until March 2015. For more cheap dates use calendar at Swiss’ website. Book now directly via Swiss. 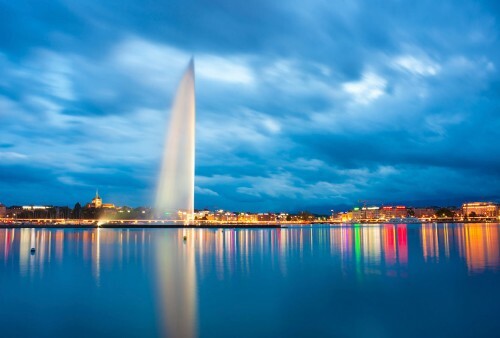 Geneva is rather expensive city which is reflected on the prices of accommodation. You can get some nice deals though if you do not need to stay in the city center. « Cheap flights to Thailand: Bangkok from London for €467!